Brainstorm continues to make me a true believer and fan with their latest release Memorial Roots. There are two things that keep impressing: the song composition and Andy B. Franck's versatile vocal performance. Brainstorm could easily be just another German (or European, for the matter) power metal dependent upon the usual double bass drum bluster and a lightning pace. But in their song composition they expand their sound into greater breadth and depth with varied and disciplined arrangements glowing with melody, harmony, and heavy metal power. Nailed Down Dreams, Forsake What I Believed, and Blood Still Stains are powerful examples of this motif. Andy Franck continues to mesmerize with his accomplished versatility. He can bring strong growling metal vocals in one song (Blood Still Stains, by example) or become smoother, almost soothing, within the same song as on Nailed Down Dreams. Most metal bands would kill for a voice like Franck's; he's one of the best going right now. Brainstorm's Memorial Roots is another excellent effort from this veteran metal band. Very recommended! 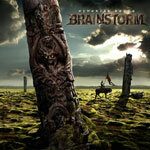 Brainstorm's Memorial Roots is another excellent effort from this veteran metal band. Strong, varied, and immensely melodic song arrangements with amazing vocals from Andy Franck make this work a true delight.